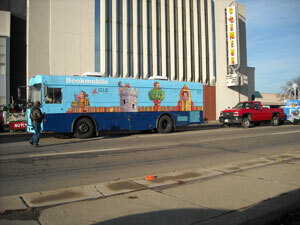 The CCLD Bookmobile enjoyed being part of the Elmira Holiday Parade the day after Thanksgiving. It was a beautiful day for November and the turnout was good. It was also the first time that the bookmobile participated in the holiday parade with finished graphics. Last year it looked like a big blue bus. But this year the wonderful graphics that Tedd Arnold designed for us were completed. Bookmobile staff are also looking forward to hosting author, Maureen Wright at the Southside Community Center in December. Maureen lives in Athens, PA and donates her time to read her books to children. She has written 3 books: Sleep, Big Bear, Sleep, Sneeze, Big Bear, Sneeze and Sneezy the Snowman. Just a reminder that the Bookmobile will be off the road from Thursday December 22nd to Monday January 2nd for the holidays. We look forward to seeing you on Tuesday, January 3rd, 2012 as we resume our regular schedule. This entry was posted in Bookmobile, Uncategorized and tagged Bookmobile, parade by ccld. Bookmark the permalink. ← Previous Previous post: Is It Just Me? : Or is it nuts out there? Next → Next post: Are you looking for that perfect holiday gift?